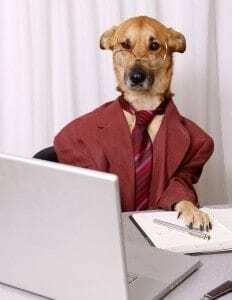 Dog dressed in business suit at a laptopDog lovers are different simply because we have to be. We’re like Marines in that we overcome and adapt. Take getting dressed for example; we’re told that everybody puts their pants on one leg at a time, but for dog lovers the question is at what time do you put on your pants? A dog lover getting ready to travel somewhere where a modicum of neatness in appearance is required cannot just simply put their clothes on. There is ritual to be observed if one is to escape with a minimum of fur, slobber, and snot, festooning one’s attire. Most of us don’t have hermetically sealed dressing rooms and even if we did, dog fur defies the laws of physics. So in order to have the least amount of doggie DNA possible creating new and interesting patterns on our clothing, the order in which we get dressed makes a difference. Just like our dog deprived counterparts, “underwear first” is usually a safe bet. We have to have something on in order to satisfy the “Your leaving so you must play with me now!” demands placed on us as soon as we exit the shower. There are those that choose play sans any clothing but I wouldn’t recommend it. Your homeowner’s policy may not cover the potential damage. After donning our under duds, the next steps are really dependent on fabric, color, and the amount of time we will have before entering our destination to pick, pluck, brush, and shuck the offending hitchhikers. The laws of static attraction state that light colored biological material are infinitely more attracted to darker materials and vice versa. Therefore we tend to dress in items with less magnetic attraction first, leaving the highly attractive materials to the last mad dash for the door. Someone who doesn’t own a dog would think the shoes are a non-issue, but they’d be wrong. My dogs know every pair of shoes I own, and more importantly they know what they are for. If the shoes are used for taking the dogs for a walk or kicking a soccer ball, the dogs will place them in front of me as if they were Dorothy’s ruby slippers. If the shoes are used strictly for dog abandoning activities, my dogs are more likely to hide them or turn them into a favorite new chew toy, especially if they are expensive. I think dogs were put here for those very things. However you choose to get dressed (or not,) have a great day.